In today’s post we’ll be presenting updates on both jQuery Core and UI as well as highlighting any upcoming training events being held and articles or videos which we think might be useful to read. We would appreciate your comments and feedback on them! This week, the core team released jQuery 1.5 to celebrate the fifth birthday of the library. This included many performance improvements and bug fixes as well as a major re-write of the Ajax module which now comes with deferred callback management. Core also introduced a new feature called jQuery.sub which allows for new copies of jQuery to be created where properties and methods can be safely modified without affecting the global jQuery object. If you haven’t had a chance to read or play around with these new features as yet, community member Eric Hynds wrote an in-depth tutorial on using Deferreds which you may be interested in. 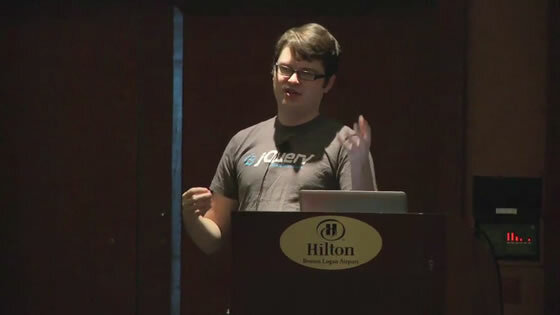 I also recorded a quick screencast explaining how to use jQuery.sub. jQuery 1.5 has already begun to be used in the wild and you may also be interested in taking a look at jQuery templating author Boris Moore’s new script loader which also makes use of deferreds. As always, we appreciate any and all community feedback on the 1.5 release and if you discover bugs or issues which you would like to report, you can do so by following our bug submission guidelines. We’ve already made a number of fixes to 1.5 (which can be tested in jQuery-Git) and we also welcome any feedback on that version as well. Remember that up-to-date information on all our future releases (including jQuery 1.5.1) can be found on our roadmap. 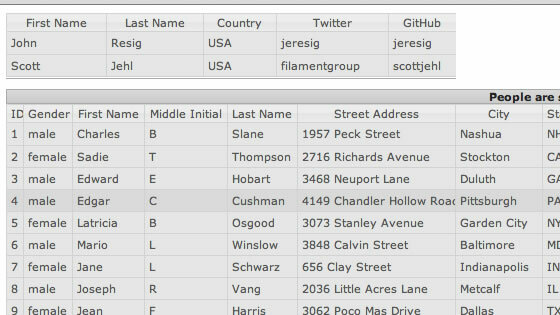 The jQuery UI Team have announced an exciting new project called the jQuery UI Grid, where they’ll be building a feature rich, fast grid widget for enhancing table data with linking, sorting, paging and inline editing amongst other features. There have been quite a few attempts outside of the project to create such widgets before, however they’ve often suffered from poor support, documentation or a lack of extensibility – the new UI grid project aims to solve these issues by providing a project-supported component that will be both modular and continually updated. We are nearing completion of development on Stage 1 of the project, which encompasses the creation of a generic data model, data type parsing, and markup. This stage will culminate in a “zero feature grid,” an enhanced HTML table that supports the jQuery UI CSS Framework and serves as a base for other grid features. Read Richard’s full blog post on the new Grid. If you weren’t able to attend the jQuery Conference in Boston last year (with speakers such as John Resig and Karl Swedberg in attendance) we’ve got some great news – almost all of the talks are now available to watch online (either on your desktop or mobile device) via our conference site. You can also pick-up the slides mentioned in the videos by clicking on any individual speaker’s talk. Group training can be an excellent way to improve your jQuery skills and Ben Alman over at Bocoup (a jQuery sponsor) would like to make a special announcement about upcoming events they’ll be holding in March and July. jQuery Team member Karl Swedberg will also be holding a hands-on training event between March 1st-3rd in Holland, Michigan. Karl will painlessly walk you through jQuery’s principles and show you how to make use of the library in your everyday coding. Karl will also be giving away free copies of his Learning jQuery book to all attendees. For more information or to register, check out the IdeaFoundry site. 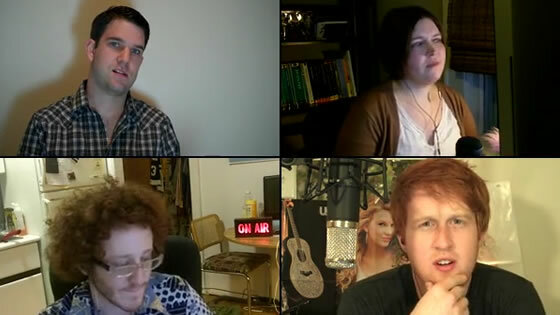 Watch or listen to the podcast at YayQuery.com. And that’s it!. If you have any interesting jQuery articles or posts which you think would be beneficial for the community to read, please feel free to mention them in the comments. We’ll be back with another Community Update in a few weeks with more news on the next version of jQuery. Until then, good luck with all your projects!. I saw the grid stuff added to the UI website a little while ago. Having used jqgrid a lot, I am very excited about this one. About the Grid, it could be a nice widget. But I have used the DataTables plugin (http://datatables.net/) recently with great success (the old one we used was tableSorter but it wasn’t full compatible with jQuery 1.4). It is very well documented and full of features (and plugins too). And it already supports ThemeRoller. So I don’t really agree with this : “however they’ve often suffered from poor support, documentation or a lack of extensibility”. But as soon as the Grid widget will be available in jQuery UI I will look at it. Anyway, thanks for the 1.5 release to the whole team. I this datagrid plugin will continue to add fucntionality, it will be the great. It is only thing i am criticizing. Really impressive release. I will try it in my next project. Its really pretty good to play with jQuery.Thanks for update in jQuery new release. I am trying to watch videos but the server is sooo slow. This is so great. I can see how this is going to benefit my projects. Awesome! Their performance test results show that 1.5 is slower than 1.4.4. Or have I misunderstood them? @Roman : of course not, 1.5 is quicker 1.4.4. Each new version is optimized. Thanks for update. Good luck with the new version of jQuery. click the homepage link. You might want to have this checked.